A Shaker School and its Builder | Brother Isaac Newton Youngs | Skinner Inc.
New Lebanon, New York, the spiritual and administrative center of the Shaker communities, was home to many dedicated Believers from 1780 until its final closure in 1947. Brother Isaac Newton Youngs, however, might be considered “first among equals” due to his seemingly endless capacity for work, and careful attention to detail. As Glendyne Wergland’s biography One Shaker Life amply shows, Youngs applied his skillful hands to nearly every aspect of life at New Lebanon. One of the great Shaker polymaths, he excelled at cabinetmaking, building, printing, music, journaling, tailoring, clock making, and a variety of other practical pursuits. Edward and Faith Andrews collected a number of objects left by the faithful Brother Isaac, some of which are included in the June 15, 2014 Skinner Auction of the Andrews Shaker Collection. Youngs was integrally involved in the construction of the New Lebanon Shakers’ new schoolhouse in 1839. He framed the building, and, as Jerry Grant documented in his Shaker Furniture Makers, even designed desks for the students and teachers. 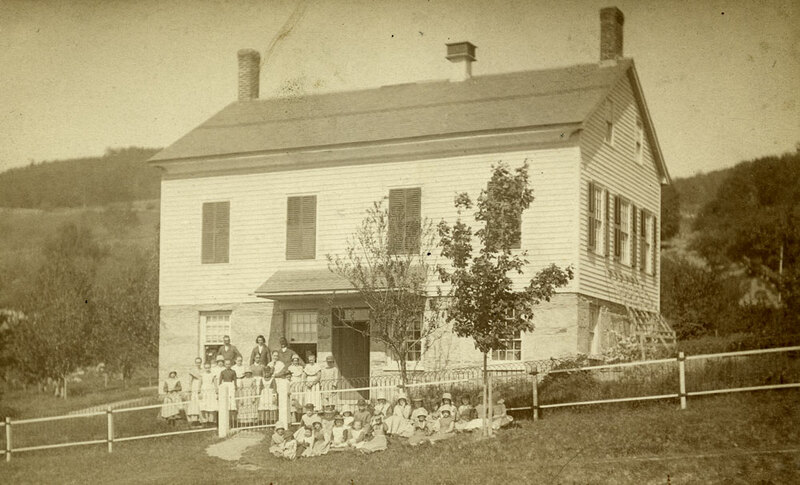 The Shaker schoolhouse with students seated in front. Courtesy, The Winterthur Library, The Edward Deming Andrews Memorial Shaker Collection. Almost 100 years after the school was built, the Andrewses were privileged to explore the disused building and found a treasure trove of Youngs’s desks, and multiple copies of both editions of Youngs’s Short Abridgment of the Rules of Music. Discovering Youngs’s musical treatise led to the Andrewses’ publication of the first full-length study of Shaker music, The Gift to Be Simple (1940). The 1839 schoolhouse was also home to what Faith described as “one of the choicest pieces in the collection:” a formidable cupboard over drawers that was used in the classroom. Sister Sadie Neale sold the piece to the Andrewses. 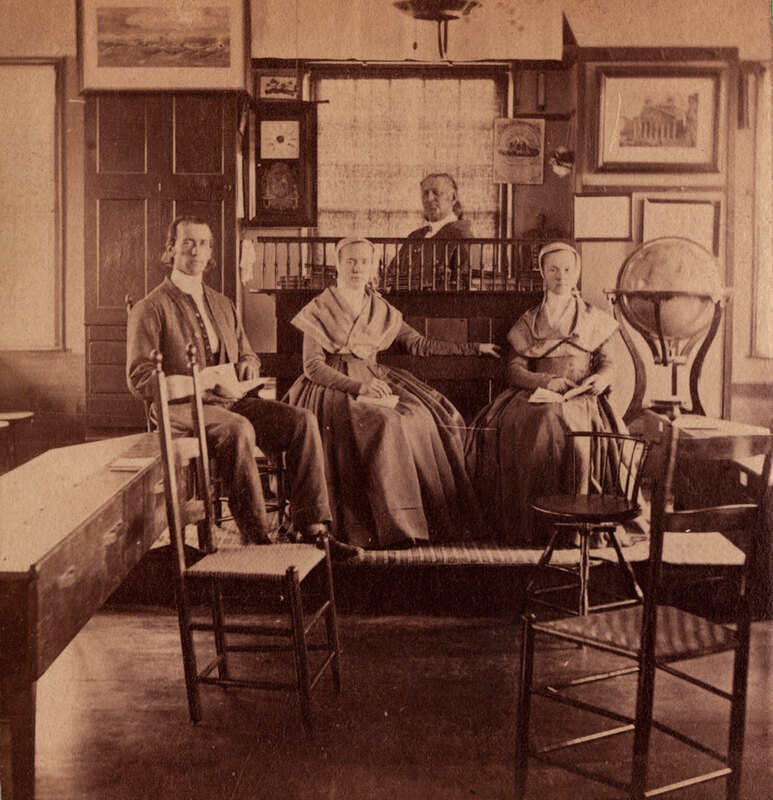 A stereoview of circa 1875 documents the piece in situ with Shaker teachers, including Calvin Reed, in the foreground. The photo shows a print hung from the two pegs (or “pins,” as the Shakers called them) on the frieze of the piece. This supply cupboard features a security mechanism of a rod that can be lowered through aligned holes drilled in the drawer fronts below, thus locking the drawers. It seems that students have not changed much in the last 180 years, and have always liked to get up to mischief. Did Brother Isaac have a hand in this cupboard, as he had in the desks and the building itself? This can never be known with certainty. What can be known is that this is one of the very few pieces of Shaker furniture that can be documented in a 19th century image in its location of use. Many of the design details of this piece are similar to those of the well-known double Trustees’ desk in the collection of Hancock Shaker Village, and featured in the Andrewses’ Shaker Furniture, plate 36. Of this piece, Shaker scholar John Kassay writes, “The arrangement of the graduated drawers and paneled doors on this exceptionally tall cupboard-chest is harmoniously elegant.”No wonder the Andrewses prized it so highly. Stereoview of the cupboard in situ at the Shaker schoolhouse (back left). Courtesy of Hamilton College, Communal Societies Collection, Richard Brooker Collection. This entry was posted in Blog and tagged American furniture, Andrews Shaker Collection, antique furniture, Brother Isaac Newton Youngs, Christian Goodwillie, New Lebanon, schoolhouse cupboard, Shaker, shaker antiques, Shaker blog series, Shaker culture, shaker design, shaker furniture, Shaker life, shaker schoolhouse by Christian Goodwillie. Bookmark the permalink.